A buddy of mine had a tattoo put on the back of his calf. It is based on a picture of his current bicycle with a big "Cannondale" written over it. Now the artist did a good job on it, but I wondered to myself what is going to happen when he changes his mind in a few years on what his favorite brand is. I likened it to getting a girlfriends name tattoo'd on yourself. Just seems like a bad idea. In the end, really don't care as it's not my leg but it left me wondering. Heck we have seen it on the forum here where a screen name depicts a certain brand only for that loyal follower to buy a new bike and then sing the praises of the new bike in posts. I guess he didn't get a bunch of stars put all over his face. Well you cared enough to come to the internet and create a discussion about it. I don't get the analogy to a girlfriends name. 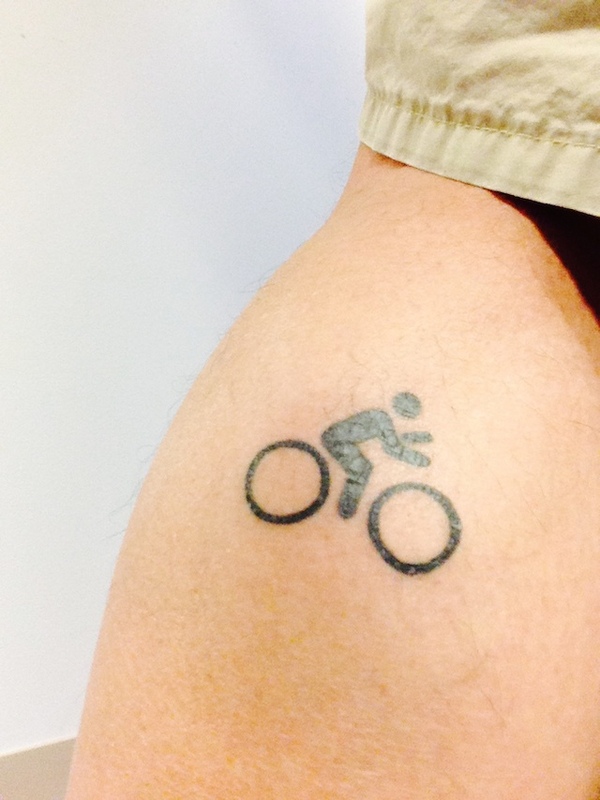 If he gets a new bike and it's a Trek, I don't think the bike will care that he already has a Cannondale tattoo. Will the Trek bike make him get a cover up? What about people who get their kids name tattooed? If they have a 2nd kid, will he get mad? What about people who get their favorite car tattooed? Does that mean they can never own another car? Or people who get their pet tattooed? Heck we have seen it on the forum here where a screen name depicts a certain brand only for that loyal follower to buy a new bike and then sing the praises of the new bike in posts. People can't like more than one brand? I don't think it's the same as a girlfriend's name. I can't really explain it but in this case the logo is just a detail on the overall image. It's not a Cannondale per se, just a bike that needed some name on it for realism. And like any tattoo, where do you draw the line between what may or may not be relevant to the wearer in a few years. You could just as easily ask "what happens if he decides to give up riding?". Tattoos can be like photographs too - just something to remind you of what had deep meaning etc. to you back when you got it. Kinda like looking at pictures of deceased family and friends from time to time. For disclosure: I have an adaptation of the Greatful Dead's "steal your face" logo tattooed across my shoulders and although I don't listen to them nearly as much as I used to I'm still happy with the tat. BTW, someone better post up Mr. Cool Ice. I can't explain that one to save my life. 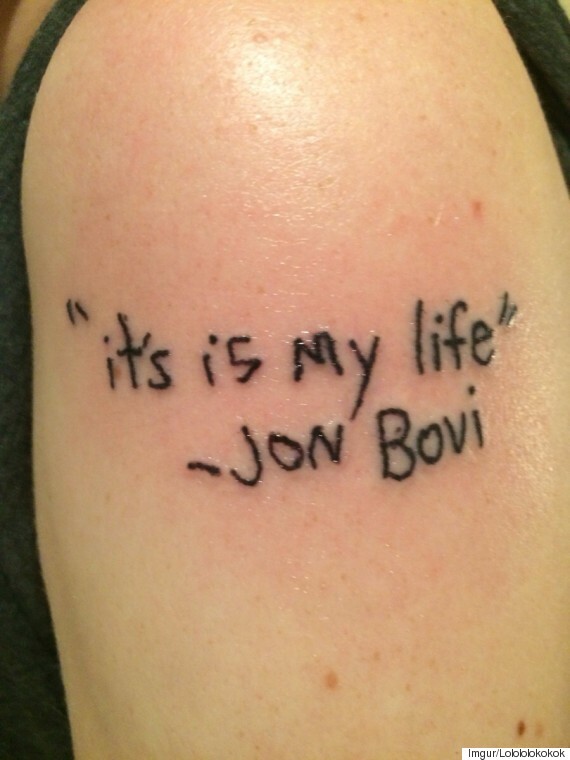 The title of your thread, "Bad Tattoo Idea" - that's redundant. People make bad decisions all the time; you just happen to know one of them. Google search for Mr. Cool Ice resulted in further puzzlement. Based on a brief search for Mr. Cool Ice and various old farts I have met over the years, this is nowhere close to bad idea territory as far as tats go. You are assuming that the gals he dates are capable of reading. ^^^^ Well said. End thread. I have nearly THE SAME tattoo on my right calf! Mine has a picture of my current bicycle and says, "Bikes Direct" written over it. My other calf has a tattoo of chainring grease on it except it's really chainring grease cause' I'm a effing' noob. Okay, okay, sorry. I typed the original post on an ipad from a train and missed a key stroke. I meant this as more of a question. I think the tattoo is pretty cool and like I stated the artist did a good job on it. My point that I failed to lay out properly was whether time specific or item specific tattoos can be a bad idea if later in life your interests etc. change. I have my answer, so I will let this thread die and apologize to the lownge for starting it. I don't get the analogy to a girlfriends name. Get a GF/BF name inked, break up within 6 months. So the belief among tattoo artists goes. Does that mean he's going to break up with his Cannondale in 6 months? 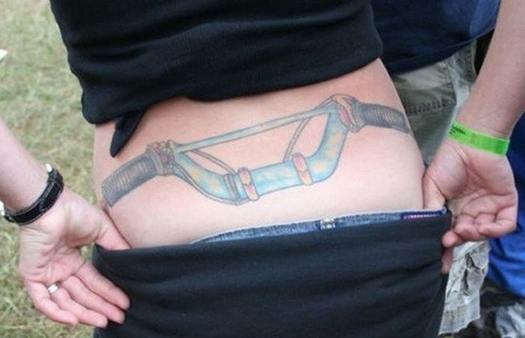 Unlike women, you can have more than one bike (and of course more than one bike tattoo). That tat is totally stupid. Now if he'd a done "Campagnolo" - different story. 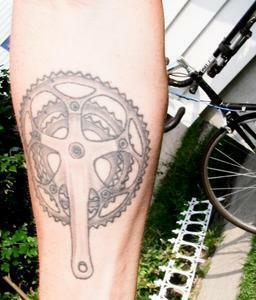 He could've had a triple crankset tattoo. Then everyone would know how weak of a rider he was and he could never get a 2x crank. I can't tell which is worse. The tat or those Scott bars. Ugh. ... and apologize to the lownge for starting it. Don't apologize, there's some funny stuff here! I thought about getting the Specialized "S" tattooed on me. I ride a lot of Specialized and my last name begins with an "S" so it wouldn't be a complete loss if I stopped riding Specialized. I wonder if there is a copyright infringement if I would use the "S"?? Tattoos are great when you're young, tight, toned and 'with it'. However, 20 years later the same tattoos are an embarrassment and cause others to question your thinking process. If it's small and somewhere easily covered, no problem, or at worst you can use the "Well me and the boys had been drinking......." excuse. Ink like the picture above (or on the neck, face, knuckles, high cleavage) just ensure you to be passed over for high management positions and cause others to assume a certain level of promiscuity and/or lack of discretion (regardless whether earned or not). I'm not against tattoos (just not for me), just against short sighted decisions. They will sue you. And you'll be forced to have that portion of skin surgically removed. Tattoos are great when you're young, tight, toned and 'with it'. Yeah, give it a few years and those bars will turn into ape hangers. How'd you get chainring grease on your left calf? That takes some complicated move. Cat 5 tattoo....then whats a cat 4-1 tattoo?